Selma Ottilia Lovisa Lagerlöf )November 20, 1858 – March 16, 1940) was a Swedish author. She was the first female writer to win the Nobel Prize in Literature. 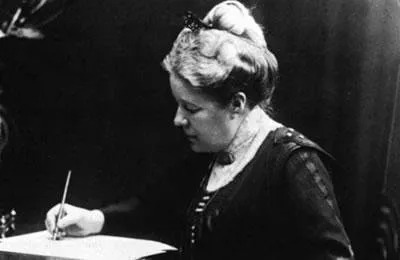 In 1909 Selma Lagerlöf won the Nobel Prize “in appreciation of the lofty idealism, vivid imagination and spiritual perception that characterize her writings”. She was born with a hip injury. An early sickness left her lame in both legs, although she later recovered. She was a quiet child, more serious than others her age, with a deep love of reading. Lagerlöf was educated in Stockholm. She worked as a country schoolteacher at a high school for girls while honing her story-telling skills, with particular focus on the legends she had learned as a child. Through her studies at the Royal Women’s Superior Training Academy in Stockholm, Lagerlöf reacted against the realism of contemporary Swedish language writers. Her first break as a writer came when she submitted the first chapters to a literary contest, and won a publishing contract for the whole book. Selma Lagerlöf was a friend of the German-Jewish writer Nelly Sachs. Shortly before her death in 1940, Lagerlöf intervened with the Swedish royal family to secure the release of Sachs and Sachs’ aged mother from Nazi Germany, on the very last flight from Germany to Sweden, and their lifelong asylum in Stockholm. Two hotels are named after her, and her home, is preserved as a museum.